Paloma’s father died when she was only three years old. Almost ten years later, she’s visiting his homeland, Mexico, for the very first time with her mom. Gathering memories about her father on index cards, she collects whatever information she can to solve the mystery of who he was, but this is not the only mystery Paloma will decode this summer. After meeting twins Gale and Lizzy, Paloma is flung into solving a dangerous mystery involving the famous artist Frida Kahlo. Studying the artist’s work and life reveals clues to what may have happened to Frida’s missing jewelry, and also teaches Paloma about her father’s life and culture along the way. This vibrant book represents a clash of cultures, a change of perspective, as well as the “growing up” theme that there are some things worth doing even when they’re “not allowed.” The youthful characters are delightful and clever, even if they do break a few rules in doing what is right. 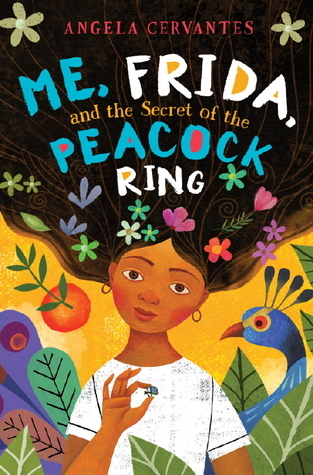 This book is saturated with details about Frida Kahlo’s life and artwork that would spark any reader’s historical interest, and it also teaches a great deal about the language and culture of Mexico through the story and integrated Spanish words (almost always accompanied with a definition in the dialogue and therefore suitable for those who don’t already speak the language). In addition to these wonderful details, this book is a fun mystery that any intermediate reader would be propelled to finish.